sorry im sure this has been asked, where can i buy a BAZ Santoku kitchen knife? you join the Blades By Baz Facebook group, wait until you see me announce completion of a new knife, then be the first person to commit to buying it. Just finished! 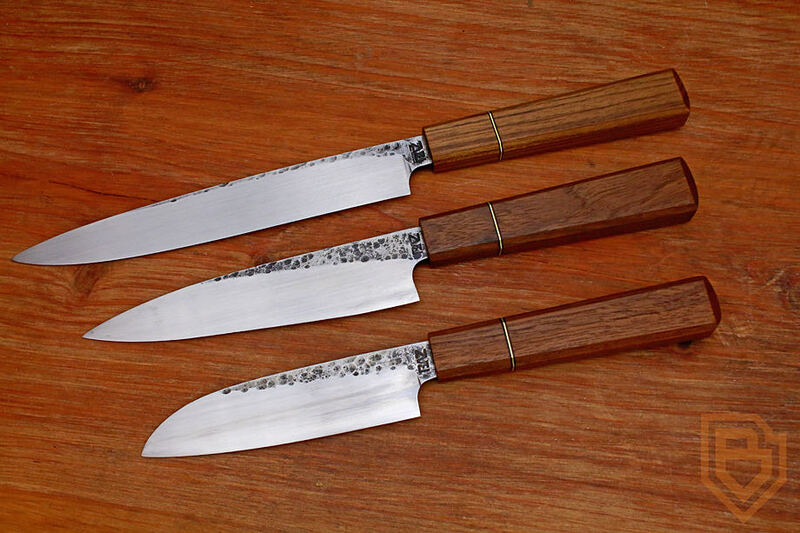 Set of three, hammered finish, high-carbon kitchen knives. Teak handles with brass and G10 spacers. Available. Edit: Blade lengths are 205mm, 161mm and 134mm. The teak is recycled bench tops from the Australian National University in Canberra. The reason teak is so valuable is for both for its elegance and its durability. Beyond its beauty, it also possesses some natural properties that other woods don't have. Google, "teak" to learn more. Amazing wood. These three knives are the last ones to have my Baz stamp on them, so they will be collectors items one day. From now on, my blades will be stamped with the new stamp you see watermarked in the bottom right of the photo. fredhoon, AgB deano, Alby1976 and 1 other person like this. Bottom knife of the three kitchen knives has been taken. Two left. Thanks mate. I fixed it, but I can only link it to one group. I have six groups on FB. I linked it to the Blades By Baz group. I really like the idea of recycling bullet cases into something else. Yesterday I smelted a bucket of them down into two solid brass ingots, ready to machine flat and turn into knife guards. Going to turn this lot into a couple of beautiful blades. Banksia on the right, eucalyptus burl on the left. These have been seasoning in my shed for years. Experimenting with a leftover Damascus stub. Managed to forge it out without any delaminations into something useable. Handle from a dead branch of a Banksia I pruned a couple of years ago. Brass is recycled bullets cast into solid bar. EvilGenius, Rubberband and fredhoon like this. Just finished this one today. An elegant hunter-style blade. 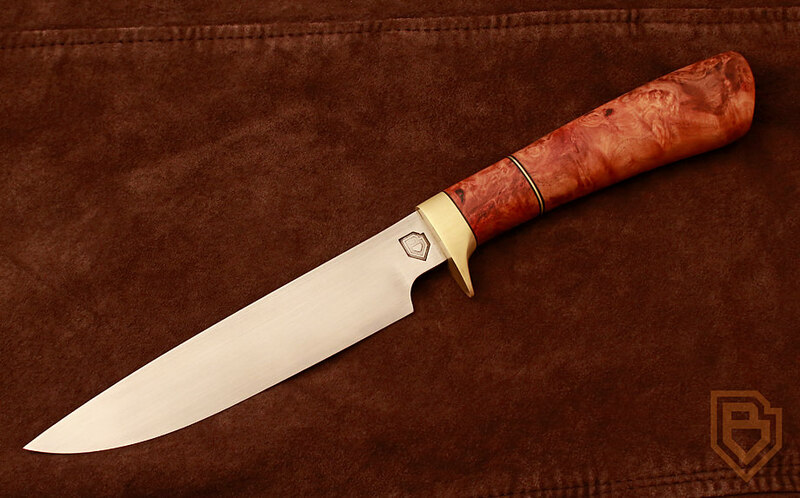 High carbon steel blade, stabilised myrtle handle with recycled-ammunition, brass guard. DSTM (Dougie) and EvilGenius like this. Japanese Kiritsuki. 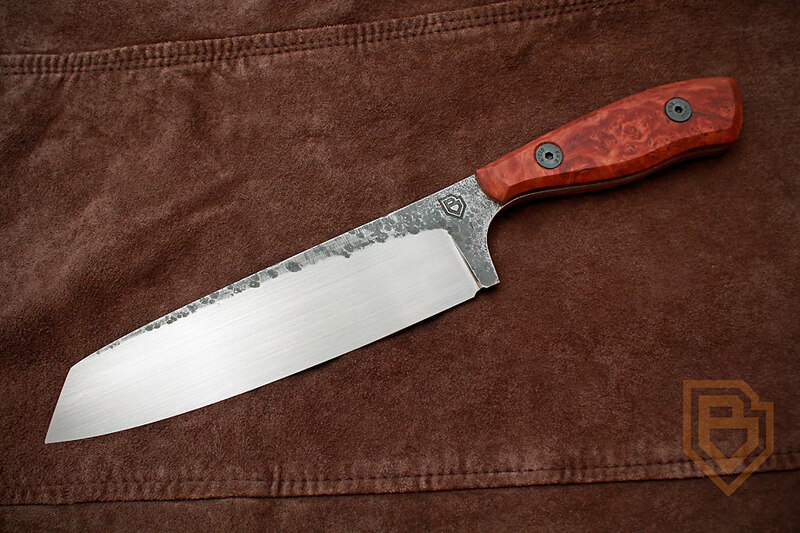 Hammered finish, high carbon blade with stabilised Coolabah burl handle. trop, EvilGenius, ThE_BiG_O and 1 other person like this. It's great to have a passion for creating stuff then get a job doing that very thing! My boss took this very arty photo of me last week, smashing out a Damascus steel billet. I gave it a quick acid etch before heat treating for a sneak-preview of the pattern. Lower count and much bolder than I've done before. I like it! Getting there... I got a nice etch this time and in doing so, learned about a thing called de-carb, thanks to Jackson. There's a spot on each side, so it's back to hand-sanding to get rid of them. Just finished - 2 Japanese style, (with a bit of western influence) Kiritsuke. 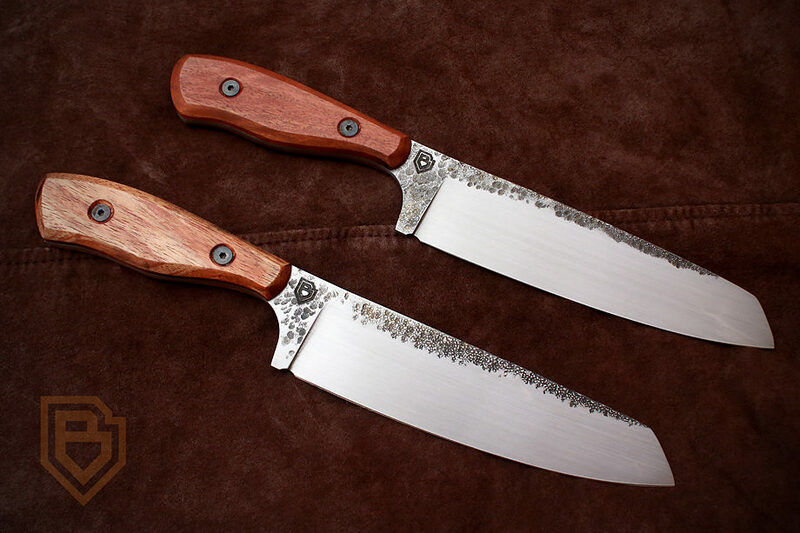 High carbon steel, hammered finish, Australian hardwood handle scales. ThE_BiG_O and fredhoon like this.